King Solomons Casino Review - Casino Answers! King Solomons takes its customer support very seriously. Before even contacting customer support, King Solomons Casino has a FAQ available for players to read and get familiar with. This will cover all of the basics such as the legalities, security, banking and more. 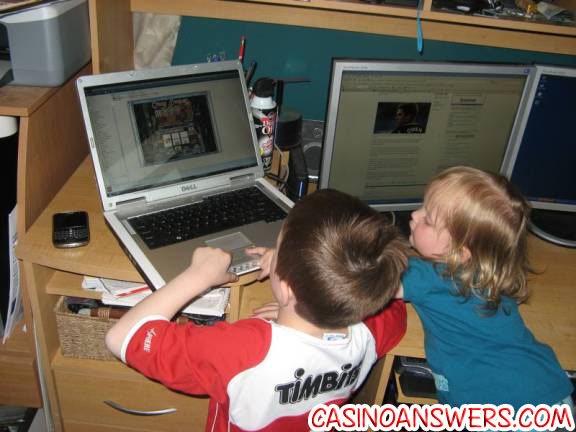 If the FAQ doesn’t answer your question, King Solomons Casino offers 24/7 live chat support. We tested the live chat out twice and were able to get helpful and prompt responses. If you prefer to use e-mail to contact customer support, it is available in eight languages (English, French, German, Greek, Italian, Polish, Portuguese and Spanish). Finally, for those who prefer to talk to the representative personally, there is also toll-free customer support in Canada, France, Germany, Greece, Italy, Spain, Turkey and the UK. If you are worried about the security of your information, King Solomons Casino is extremely secure, using 128-bit encryption and the strictest of confidence to keep your personal and banking information under wraps. The first deposit bonuses at King Solomons Casino are excellent. There’s a 100% to $100 bonus which is credited instantly to your account, and then a 50% to $250 deposit bonus using the bonus code NEW102 on your second deposit. This is a total of $350 in Signup Bonuses. Although there are games that you can’t play on(like most table games) to clear the bonus, the 20x wagering requirement is excellent, and one of the lowest in the industry. In this day and age these are the best a bonus hunter can get. King Solomons Casino uses both RTG and Playtech software. Although we are reviewing the RTG casino software, they are increasingly pushing towards the Playtech software as of late. While their software is only made for Windows, non-Windows users can still play at King Solomons Casino thanks to their instant play casino that you can play on your browser. 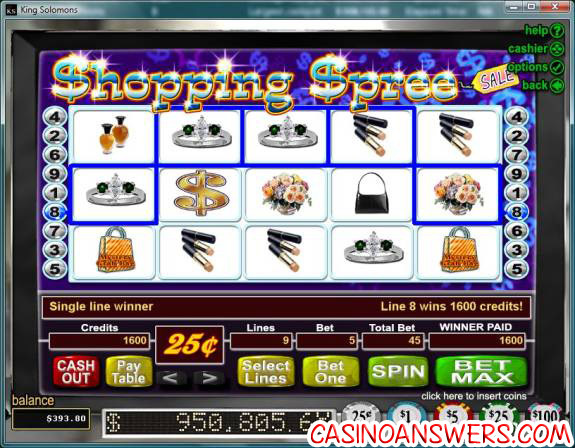 This utilizes flash software, and is basically the same as the downloadable casino. It launches very fast and is easy to use. Their lobby has a very simple layout. This may not be the most eye-pleasing lobby we have seen, but it is very easy to navigate. Too often online casinos have drop-down menus upon drop-down menus that with one false move with your mouse and you’ll have to go all the way back to the start. There is none of that at King Solomons Casino. It is very well organized, putting functionality over presentation. As of this writing, the RTG version of King Solomons Casino currently offers 20 table games, including the likes of Blackjack, War, Red Dog and Pai Gow Poker. King Solomons Casino offers 92 different slot machines with a lot of varieties like Real-Series Video Slots, Video Slots, Three Reel Classics and the Bonus Three Reel. King Solomons has a variety of video poker games, from 7 Stud Poker to 5 different Wild Card games, Double Jackpot Poker and 5 different versions of Jacks or Better. King Solomons Casino has a nice variety of “speciality games” – along with the usual American and European Roulette, they offer European Slot Poker, Keno and Bonus Bingo. King Solomons Casino also has 4 different scratch cards available – Hot Dice, Lucky 8’s, Magic 7’s and 5 Diamond Blackjack. Aside from regular bonus promotions, King Solomons Casino offers a VIP rewards program to cater towards its loyal players. The King Solomons Casino rewards program is the standard loyalty program you see at most casinos. There are different VIP tiers, and the more you bet, the higher the tier you enter. You earn more points the higher tier you are at, and you can redeem every 100 comp points for $1. You can earn up to 15% cash back with the loyalty program at King Solomons Casino. King Solomons Casino has been known to hold special promotions for players on an irregular basis. Note: Brant wrote so much we couldn’t fit it all in above. Full review by him is below. RTG is my favourite software provider, so I was happy that when King Solomons Casino moved over to Playtech that they kept their RTG casino intact. The RTG software has the best video poker I have played at any online casino, so that is what I most often am playing when I play at King Solomons Casino. What first caught my eye about King Solomons Casino was what they offer in bonuses. They have a $350 welcome bonus – which is actually two bonuses of 100% to $100 and 50% up to $250. I had no problem clearing the bonus, even though video poker only counts towards 33% of the 20x bonus requirements. If you are looking to sign up at King Solomons, you shouldn’t have any problems clearing this bonus especially if you’re big into slots. Do what I did and sign up at King Solomons – you won’t regret it! I signed up at King Solomons through this site and have been impressed by their promotions, selection of games, quality of games, speedy transactions and customer support. 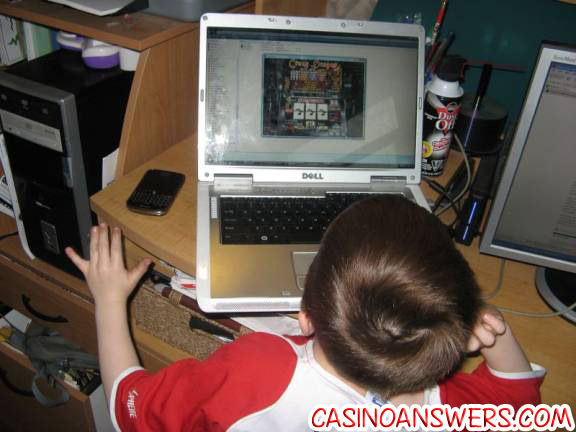 It is the most enjoyable experience I have ever had playing at a casino online. 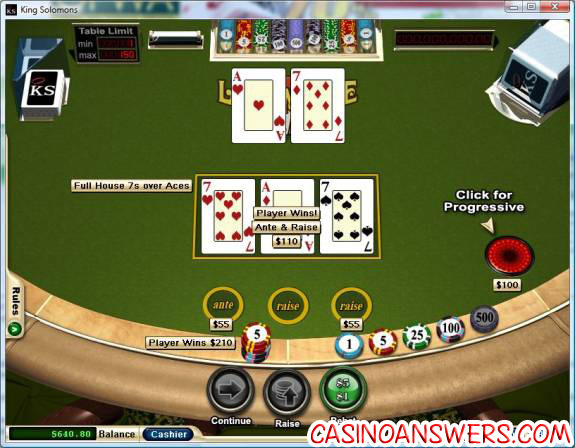 King Solomons Casino is a Realtime Gaming casino that launched all the way back in 1998. With many fly-by-night online casinos flooding the Internet, it’s shocking to think that one has been around for well over 10 years. Once you play at King Solomons Casino, you will see why. King Solomons Casino offers a 100% up to $350 signup bonus over the player’s first two deposits. Unlike some places that offer great casino signup bonuses, the bonuses are easy to clear. King Solomons Casino provides 24/7 customer support in eight different languages with live chat and toll-free numbers for many different countries. King Solomons’ customer support is not only fast and friendly, but also very capable of handling your inquiry with care. This is an old casino review we wrote on December 17, 2005 for King Solomons Casino. We have stored it here for archival purposes. Ah to be a King. King Solomons Casino is an average looking casino, with the standard features you’d come to expect from any online casino. Easy to use software, play money and real money, great support and so on. Luckily for them, in an area where most casinos struggle to be average, they have a fairly decent VIP program. Their lobby looks outdated graphically, something from the 1980s, and is very annoying to navigate depending on the game you choose, with various submenus that go all over the screen and blend with one another. King Solomons’ promotions are very good, with lots of deposit options and bonuses, and frequent reloads. Promotions: $350 Welcome Bonus. 100% Monthly Reload Bonus. King Solomons Casino Bonuses: 100% sign-up bonus (up to $100). 50% sign-up bonus (up to $500). 100% monthly reload bonus. 15% cashback. 10% bonus on first two deposits for using preferred payment methods. King Solomons Casino VIP Club / Loyalty Rewards: King Solomons has a well thought out and easy to understand VIP Club Structure. There are four levels, Silver Class, Gold Class, Platinum Class and Diamond Class. The more you purchase and wager, the higher club you are moved into, for a certain membership period. For example, purchase a minimum of $30,000 and wager $750,000 and receive 90 days membership into the Platinum Club. Each club has various different benefits. They all increase your credit card limit, as well as your bet limit. You also will receive random cash bonuses, automatic entry into VIP Loyalty Club promotion and faster payouts. Depending on the level you are at, you also receive exclusive annual gifts, invitations to VIP only competitions and promotions, and your own dedicated VIP hotline. Why is there both a Playtech and RTG version of King Solomons Casino? When King Solomons Casino first launched in 1998, it started out under the Microgaming banner. Later, it switched over to Realtime Gaming. Finally, it settled on Playtech. However, King Solomons Casino recognized that many of the existing players were happy playing on the Realtime Gaming software, thus a compromise was made. This is a prime example of King Solomons’ dedication and commitment to its players. King Solomons Casino is available in the following currencies: US Dollar, Euro. King Solomons Casino offers two totally separate platforms – Realtime Gaming and Playtech. For the purposes of this online casino review and this games list, we are looking at the RTG platform version of King Solomons Casino. If you want to play at a Playtech casino, we suggest you visit Bovada. We have written up brief summaries of a few of the games on the RTG platform with complete reviews linked when they are available. Roaring Twenties Bingo Speciality Game: Roaring Twenties Bingo, if you couldn’t tell by the name, has a 20’s theme. This is complete with jazz music playing in the background at all times. You can bet anywhere from a penny per card up to $5 per card. You can choose to play extra balls, which will double your total bet. You can play anywhere up to 100 cards per game. Roaring Twenties Bingo features three jackpots – a Maxi Jackpot plus two random jackpots called Minor and Major Random. In order to win the Maxi Jackpot, you must fill up your card (coverall). Other major winning patterns include a box (250X your bet) or an “I” (100X your bet). There are also several other winning patterns available. Tri-Card Poker: Tri-Card Poker (also known as Three Card Poker) is a popular online casino game and is available at King Solomons Casino. You can bet anywhere from $1 up to $100 per hand. There are three betting circles on the table – Pair+, Ante and Raise. Pair payouts are 40:1 for a Straight Flush, 30:1 for 3 of a Kind, 6:1 for a Straight, 4:1 for a Flush and 1:1 for a Pair. Ante Bonus Payouts are 3:1 for a Straight Flush, 2:1 for 3 of a Kind and 1:1 for a Straight. It’s A Mystery Video Slot: It’s A Mystery is a 25-line Real-Series Video Slot found at King Solomons Casino on the RTG software. It’s A Mystery has a detective/mystery theme. There are two randomly won progressive jackpots, a 7500 coin top fixed jackpot and a guaranteed bonus game feature. For more on this exciting video slot, please read our It’s A Mystery Video Slot Review. King Solomons Casino has a healthy selection of progressive jackpots to choose from. At this time, the King Solomons Casino software currently does not offer or support any casino tournaments. We look forward to tourneys being implemented at King Solomons in the near future. Until then, we suggest you check out Bovada for some online casino tournaments. When you decide to sign up and make your first deposit at King Solomons Casino, you will receive a 100% up to $100 bonus on your initial deposit. To get your first deposit bonus, make sure you enter the bonus code coupon New101. Your account will instantly be credited with the bonus. On your second deposit, you will receive a 50% up to $250 deposit bonus. To receive your second deposit bonus, use the bonus code coupon NEW102. In total, you will receive a $350 signup bonus on your first two deposits at King Solomons Casino. Both bonuses have a 20x wagering requirement, which means you will have to wager the deposit and bonus twenty times each before you will be able to cash out. Play on Craps, Baccarat, Roulette, all Video Poker games, Tri-Card Poker, Caribbean Hold’em and Caribbean Stud Poker, Blackjack, Perfect Pairs, Sic Bo, Vegas Three Card Rummy, Red Dog Poker and War before you have cleared your wagering requirements will void your winnings. This is a standard-level wagering requirement and is much easier to clear than other casinos that boast higher bonuses. Players from the United Kingdom and Ireland are not currently eligible for the signup bonus. On top of all of that, King Solomons Casino will give players who make their first and second deposits using Neteller, Wire Transfer, Click2Pay, Moneybookers or FirePay an additional 10% bonus. Once you are done with your $350 signup bonus, as an existing player, King Solomons Casino will send you an exclusive 100% reload bonus offer every month in which you deposit $200 or more. This bonus can only be played on Slots and Keno. Finally, King Solomons Casino will send out weekly e-mails listing all of the latest bonus promotions at the casino. Keep an eye on your inbox for all of the latest bonuses they are offering. Hey guys, I’m Dan and this is of course my online casino blog. I will be starting the blog tomorrow, November 2nd 2009. The first online casino I will be choosing to play at is King Solomons Casino. I put a bunch of casinos in a spreadsheet, then randomized them and picked the casino listed at #23 – my lucky number. God I am such a geek. So yes – King Solomons is the winner and the first casino to be blogged about!Play at this years #1 online casino for United States - Slots.LV. King Solomons have a 100% match bonus, so my bankroll will be starting up at $200. King Solomons Casino uses Playtech software, and have been online for 11 years now which is quite incredible. I’m looking forward to playing here as I enjoy Playtech software. The download process was easy. I went to the website and BOOM – little popup asking me to download. I sign up, deposit $100 with Moneybookers and that is that – no bonus code needed, $200 immediately in my account. Nice and easy. I look over the bonus terms and conditions – this is something that is VERY important, as you don’t want to mess up and win a progressive jackpot then be told that you aren’t eligible haha. So I check that, and I see that there is a lot of games that don’t count for the wagering requirements – the usual games like Roulette and Video Poker. If I remember correctly, while you are clearing a signup bonus at Playtech they actually block the games that don’t count which is handy, plus if Roulette is blocked it stops my temptations to martingale! Other than that nothing too scary about the terms and conditions. Everything looks good so far. I bring up a live support window via the client, and within seconds I am chatting to live support. All I wanted to do was test it out to make sure it worked, and it sure did work. That is that for tonight. Let’s win us some progressive jackpots tomorrow. Day one playing and blogging at King Solomons casino, and I immediately hit the Let ‘Em Ride tables. This is a game I have never played at a casino – only via some online flash games – and I really enjoyed it. I do $1 bets and…well, I don’t enjoy it too much. Within a few minutes I’ve lost practically every hand, and from my $200 I have dropped to just $90. Yikes. It was that stupid “I’ve lost the next 10 hands, I’m due this time” thought that you just can’t escape. This may be a short diary!Play at this years #1 online casino for United States - Slots.LV. I decide to leave the table, and am ready to call it quit for the nights when I decide to check out some progressive slots. A lot of them are multi-line slots, but I decide to stick with a single line slot in the Crazy Dragon Progressive Jackpot Slot. The current jackpot is at $9151.25. Each bet is $1, so I start playing 3 coins at once – the max available. Hey gotta bet the max to win that jackpot! I decide to leave if I get to $50. However I don’t come CLOSE to this. I immediately hit 3 dragons for 20 re-spins and my balance starts going up and up and up. I am seriously hitting everything here. I manage to work my money all the way up to $459 and decide to stop for the night. A very productive night, as I am +$259 for the evening, and cleared a good chunk of my bonus clearance I expect. Sorry for no screenshots – my screen capping program apparently didn’t work correctly, as every .jpg is messed up. I will make sure it is fixed for tomorrow. Welcome to day 2 of 5, in my online casino blog of King Solomons Casino. Yesterday I had a rough start, going from $200 down to $90 at the Let ‘Em Ride tables within minutes. To say I was upset at this would be an understatement. 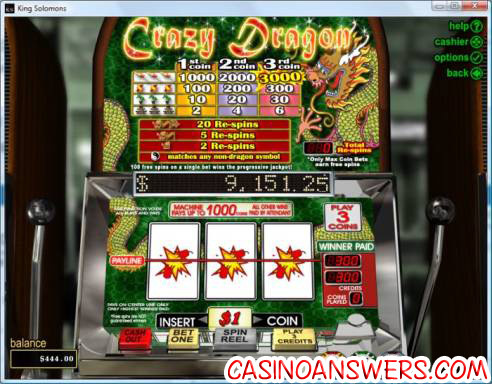 Things turned around however, when I gave the Crazy Dragon Slot Machine a good beating, ending the night at $459.Play at this years #1 online casino for United States - Slots.LV. My first stop is the Crazy Dragon Slot Machine again – can lightning strike twice? I start with $459. Spin. Nothing. Spin. Nothing. Spin. Nothing. Spin. Nothing. You read that baby correctly. I managed to get 3 of the dynamite sticks, for a cool 300 bones. With the $444 I already have, that puts me at $744. I decide to push my luck a little, and go for some more wins. I manage to get to $802, and with that we call it a night. That makes me +$702 thus far. Thanks King Solomons! Wednesdays, the middle of the week, and we’re getting close to finishing our tour of King Solomons casino. From my initial deposit of $100, our balance currently reads $802. Excellent. All that money is thanks to the Crazy Dragon Slot Machine, however I want to go back to the game that crippled me early on – Let ‘Em Ride. It’s one of my favourite games, and hey – I’m due, right?Play at this years #1 online casino for United States - Slots.LV. Well in this case, YES. After a couple of small wins and some losses, I hit the jackpot! Well – not THE jackpot – but I did get a full house, which sees me rake in $210. Oh baby. That plus my intial bets means that my balance is sitting pretty at $960. I play a little bit more, and get it over the $1,000 mark. Calling it quits for the night. Two days left, and I’m up over $900. I love it. King Solomons Casino – I love you! I send them a chat message to check my wagering requirements, and I have about $1500 left to do, so time for some grinding. I play some different progressive slots – The Shark, Mid-Life Crisis and I.R.I.S. 3000, but none of them quite take my fancy. I end up going on a horrible run too, running my money down to under $400. Yikes. A paranoid person would say that once I asked about the wagering requirements, the online casino hit the doomswitch on me haha. Hmmmmmmmmmmmmmmmmmm.Play at this years #1 online casino for United States - Slots.LV. Nah, just kidding, and thankfully I have the screenshot to prove it. I started playing the Progressive slot machine Shopping Spree, which had almost a million dollar progressive jackpot. Oh so sick. I fell in love with this slot machine, and my balance seemed to hover around the $400 mark constantly, until…..
OH BABY. Diamonds are definitely MY best friend, that’s for sure. 1600 credits at $0.25 is a $400 score, bringing my balance to $793.80 for the evening, and I go out a winner. One more day in the casino blog, and we should have the wagering requirements cleared and hopefully leave a winner. Shopping Spree is my new best friend! Welcome to the final day at King Solomons casino. This has been a fun time of it, that’s for sure. I’ve had some big winnings, and bar a nightmare I should leave a winner. Nice to get this online casino blog off to a great start with some online casino winnings! Bonus! I hit up shopping spree, although don’t have much luck at all. I switch to Crazy Dragon and still nothing, and I’m now down to about $380. Where the hell did the money go? Goddamnit. Then the funniest thing happens – I leave my laptop up to go for a smoke. I return to find this wonderful picture……Play at this years #1 online casino for United States - Slots.LV. BOOM. My son picks up a nice little win. After clearing the two of them off, I check the wagering requirements….and I am clear. With $439 sitting in my account I withdraw, for a nice +$339 profit. I also ended with 752 comp points, which I am able to turn into $7.52(and immediately lose at the tables haha). A great start. I’ll be back on Sunday with a new casino to blog about. Feel free to leave any recommendations in the comments below. Also thanks for being patient with me in the beginning stages of this website. It’s tough to get into a groove – once I do, I’ll be sure to write a lot more, provide a lot more pictures and screenshots and so on. I just wanted to focus on getting the blog done this week, and getting all the website mechanics set up. Thanks. And also thanks to King Solomons Casino for being my first guinea pig – and a very successful one at that! If you want to check out the casino for yourself, click here. Just be sure to play some Shopping Spree! I was hooked on that game. Well we’ve had a little withdrawal snag at King Solomons. I logged in to find that 24 hours after making the withdrawal to my Moneybookers account, the withdrawal had been declined. WTF?Play at this years #1 online casino for United States - Slots.LV. So I bring up live chat immediately(incident #62857). I talk to Sean, who states that there might have been a problem at the moneybookers end. Now I have a VIP account at Moneybookers, so if there was ANY problems they would call me immediately. I tell him that is not the case. He looks into my account again and states that there are no restrictions on their end, so I am perfectly eligible for a withdrawal. We decide the best course of action is to request the withdrawal again, and if there is still a problem to call me. Pls don’t screw me pls don’t screw me pls don’t screw me. I’m happy to report that I got my withdrawal from Moneybookers. I’d written earlier about King Solomons withdrawal problems but thankfully it was all sorted.Play at this years #1 online casino for United States - Slots.LV. What I was very happy about was the speed of the King Solomons withdrawal. It took less than 24 hours for it be processed, and on a weekend too. Very impressive thanks guys, and I’ll be returning to that casino for sure. Play at King Solomons – click here.